You develop a freemium app, it’s all set and done, and you want to increase your revenue by in-app advertising. It could be tricky choosing the right ad format for your application since you will have a variety of ad types to apply on your app screen; and depending on the nature and the category of your app, it is important to know which format would be a perfect fit. For that matter, we wanted to make things easier for you; so here is a detailed guide about the allocation and usage of ad types. Simple, yet effective. Banner ads are basically rectangular rich media ad units that could be served at the bottom-top or in-app feed, aimed at catching the visitor’s attention and leading them into the advertiser’s page by clicking the ad. Banner ads could be image or text-based and are very common because of the fact that they can fit into any screen size, but also it’s the cheapest type of ad to be displayed on a screen. Due to its nature, it wouldn’t be wise to place a banner ad on game apps; since it risks to discomfort the user while actively playing a game. Accordingly, non-gaming apps are the perfect fit for banners; such as shopping, finance, sports, lifestyle or music. Concerning eCPM levels, banner ads are most likely to have low eCPM compared to full-screen ads (rewarded, interstitial or offerwall). To sum up, banner ads are easy to use and available for almost all platforms; so if you want to have a basic type of ad displayed on your app, you can always use banners. But if you are looking for something extra, and also to have higher levels of eCPM, you should dig deeper. Undercover ads: native ads are ad units that blend in with the application’s natural display, and they are less advertisement-look alike. So basically, the goal here is to make the advertisement harmonize with the application’s pattern, and as an advantage for that, they cannot be blocked. Native ads are also great since they do not pop up as a regular ad, which might be disturbing for the user after seeing thousands of banners. 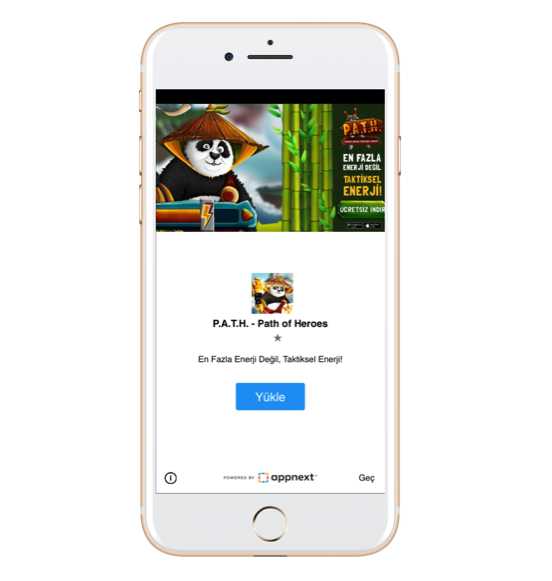 Native ads, like banners, are also compatible with applications which are based on content rather than active engagement – like a game; in addition to that, for both of these two types of ads, the essential point is to be easily visible and noticeable. Native ads is cheap and basic, just like a banner ad, but a little bit is hidden inside the content. Banners and natives occupy only a small space on the app, but if you want an ad that will cover the screen at length, that’s where we see interstitials. An interstitial ad can be an image or a video, it also can be static or skippable. Interstitials tend to be catchier for the users since they take up the entire screen and leads them into either clicking or skipping the ad. The most important rule on interstitials: DO NOT DISTURB THE USER ON A TASK! If the ad pops up while the user is actively engaged in an activity or gameplay on the app, it would create nothing but discomfort; so it would be better if the ad is used at a natural break. Moreover, it would have a negative effect on user experience if an interstitial is placed directly when the app is opened. Interstitials could be a good type of ad for game apps, and most of the game apps use them. They can be embedded in between levels or user-based pauses. eCPM levels of interstitial ads tend to be higher compared to the eCPM of banner and native ads. If we are talking about the gaming industry, rewarded videos are there to conquer. Let’s follow an example: you are playing a game (Looking for a really cool one? Check Head Ball 2* out! ), and you are out of credit. You desperately want to continue playing, and that’s when rewarded videos help you out. This type of ad completely depends on the request of the user, so that means the user is the one who lets the ad pop up. 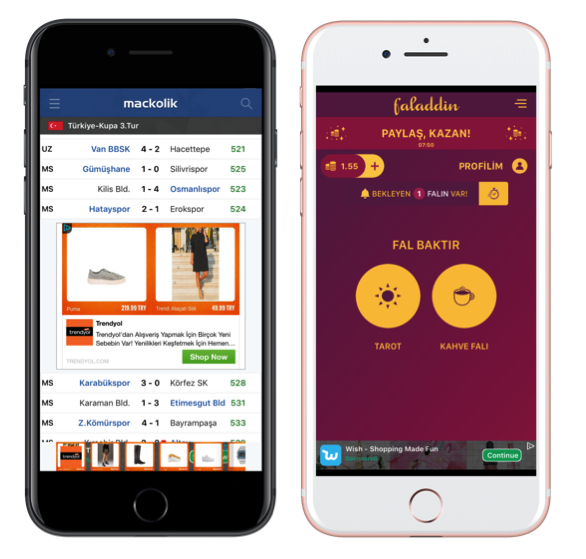 The user watches the video, and it rewards the user in terms of app currency or a level up. Rewarded videos are perfect for attraction and retention since in order to get the reward, the user must continue interacting with the ad until the very end of it. Including rewarded videos within the right amount and exact timing to your app could boost your revenue, as well as your user satisfaction. Rewarded video ads are more fruitful compared to the first three types we have mentioned. Keep your customer served a good amount of rewards, and voilà, you will also be rewarded with higher eCPM and income. *For iOS version, click here. For Android version, click here. Working as a reward store, an offerwall in a mobile app is a list of incentives a user can receive by performing a specific action, typically downloading another app, watching a video ad, or sharing content on social media. Incentives are often in-app rewards such as digital currency or additional unlocked app content. Offerwalls are user-initiated, in other words, their appearance on the app completely depends on the will of the user; just like rewarded videos. Again, both of the ad formats are perfect for gaming apps; also they can be used in communication apps. As a monetization solution, offerwalls provide the publishers with a great opportunity to make money out of advertising. Still, have questions in mind? Contact us and we will help you find the right type to boost your app!